Another two seam details today! The first is a very simple treatment that runs along side some vintage lace. Using perle cotton #8, I worked 3 detached chain stitches in a fan formation so they look like half daises. At the base I added a small pearl bead. On the lace itself I added some seed beads. The lace I found in junk shop in Oxford, England. I was browsing the store when I spotted a roll of lace . Someone had wound pieces of lace on to the broom handle and slipped a pin into each piece to secure it. The roll was about 4 inches thick and the pins had rusted. The wad of laces looked to me as if they were of 50’s vintage because that was what was on the outer layer and what I could see. However since the pins had rusted, there was no real way of knowing what was there. At the time I was curious about it and when I expressed an interest the shop keeper removed two pieces from the roll to discover the lengths were about 15 cm (6 inches) long. Not only was the lace short but removing each piece was likely to be a challenge. She offered them to me for a couple of pounds and I jumped at it. I don’t like cutting into vintage lace for crazy quilting but damage lace I think is more than fair game for crazy quilting. I think they were samples from a lace maker as each was tagged. To my amazement I discovered as I unwound the samples they got older and they went back to the Victorian era. Unfortunately they were all badly damaged. The use of numerous pins to secure each piece had caused rust and mould had also caused stains. What was worse the samples were often torn. If they were in good condition I would not have used them for crazy quilting but since they were damaged I felt there was no harm. I dyed the badly rust stained, repaired what was worth repairing. Basically I reclaimed what I could and made something of it. 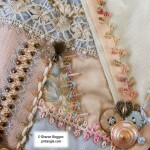 I have used many of these laces on this quilt and they influenced this quilt in another important way. Because I wanted to use the scraps I had salvaged I decided to make the blocks the size they are. I felt the proportion of the blocks to the laces, highlighted them better than if they had been used on larger blocks. Also many were too small to use on larger blocks. 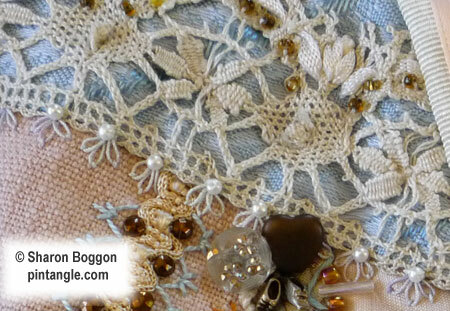 The next seam was covered with some braid and some very small vintage beads found on the same trip to England. 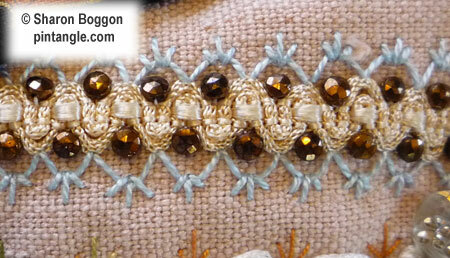 The edge of the braid is a fly stitch variation worked in cotton perle # 8. Both details are from block 84 of my I dropped the button Box Crazy Quilt. This article is part of a series that highlight the hand embroidered seams and details on my crazy quilt called I dropped the button box. A lovely story about the lace Sharon. What a find. And I love those vintage beads too. Thank you for all your help and information this year, and I hope you have a wonderful time with your family over this festive season. Lovely seams. The information about the lace, and the details of how they can be used is very useful.